This change worsens the coming "Seattle Squeeze," by blocking access to the ramp for a fourth week, until the new Highway 99 tunnel and Sodo interchange open the week of Feb. 4. An average 12,500 drivers per weekday use this entrance off Royal Brougham Way South. 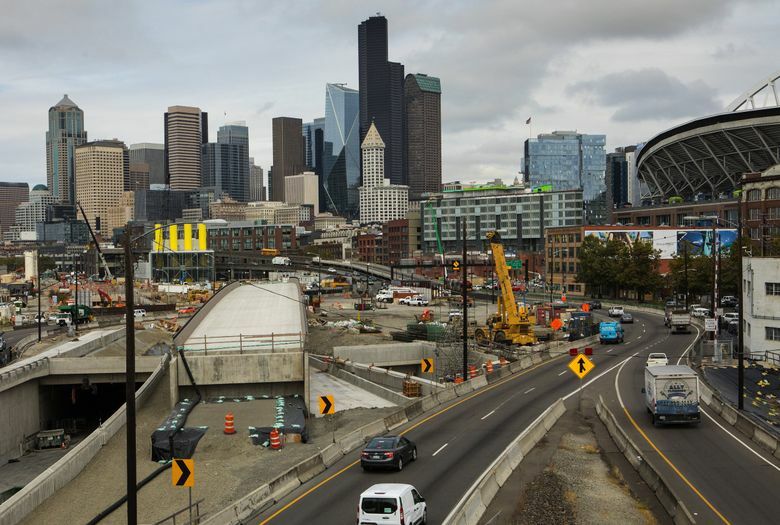 The busy Sodo entrance to the northbound Alaskan Way Viaduct will close the night of Jan. 4 — a week earlier than the permanent viaduct shutdown on Jan. 11 — state project officials have announced. This change worsens this winter’s “Seattle Squeeze,” by blocking access there for a fourth week, until the new Highway 99 tunnel and Sodo interchange open the week of Feb. 4. An average 12,500 drivers per weekday use this entrance off Royal Brougham Way South, where it carries not only the local vehicles departing Sodo, but also commuters coming from West Seattle or Burien who drive to the onramp via First Avenue South. An extra week will give contractors more time for critical work that could pose “unanticipated challenges,” says the Washington State Department of Transportation (WSDOT). That job includes uncovering a northbound ramp to the new tunnel that was built in 2011, then buried by dirt and Geofoam so the current four-lane highway segment could operate for eight years. From Jan. 11 to the week of Feb. 4, contractors will attach new tunnel ramps to surface streets for three weeks, at both the north and south ends. WSDOT previously said the other current Sodo ramp, where southbound traffic exits to South Atlantic Street near the stadiums, would close Jan. 4. In this location new concrete is being installed between Alaskan Way South and a bridge abutment, an ongoing job that caused weekend closures this year. Meanwhile on the north side, WSDOT last week opened the new stretch of Sixth Avenue North between Denny Way and Mercer Street, and a new ramp will feed directly from Sixth into the southbound tunnel deck in February. In 2009, state lawmakers and Gov. Chris Gregoire chose the four-lane, deep-bored tunnel to replace the now 65-year-old viaduct. The total construction cost, including ramps and surface streets, is $3.3 billion, not including possible overruns. Contractors sued the state and insurers following the December 2013 stall of tunnel-boring machine Bertha, which underwent two years of repairs. About 90,000 vehicles and 30,000 transit riders now use the viaduct on weekdays.